Startup Clinic with Nick Yang - 3rd June 2012, 2pm-4pm. Chinese Entrepreneurs Organization Singapore (CEOs) is planning a “Startup Clinic” session this weekend with one of their mentors, Nick Yang, and they would like to invite startups/founders/entrepreneurs for the session. Chinese Entrepreneurs Organization Singapore (CEOs) proudly presents to you the 8th episode of Experience China & Explore Opportunities - What About Social Commerce on 28 Mar 2011 (Mon). Ever wonder how the group purchasing works and what is going on in social commerce? Please RSVP by 27th March 2011(http://rsvp.ceo-s.org/episode8). Our second CEOs Salon will focus on the topic of Entrepreneur Psychology. 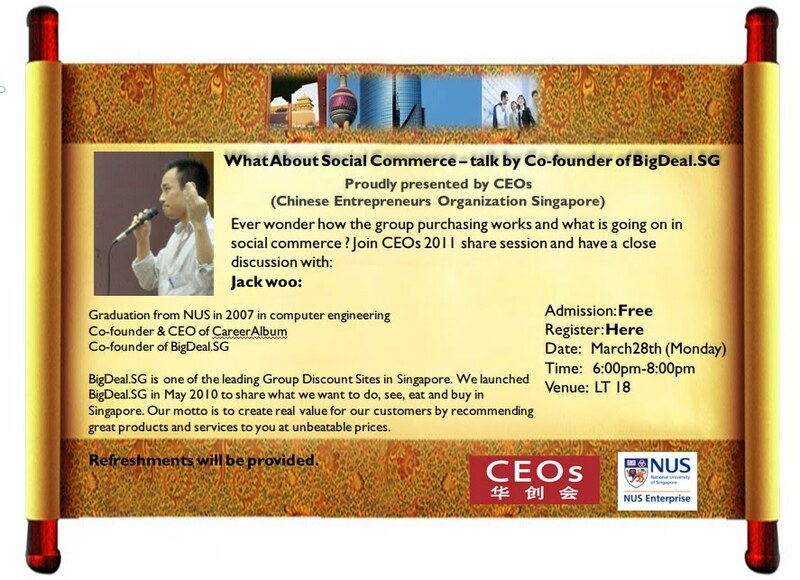 Join us with our guest, Mr. Wu Di, who graduated from NUS and started his business when he was a university student. Currently, he is managing three companies, one education and two game companies. You may refer to their respective website to find out more information. As a young entrepreneur, Mr. Wu will share with us his experience of starting a business in campus. Through the interactive session, he will also help all potential entrepreneurs, like you, to build a very strong subconscious mind that can find a clear path to success despite the ever increasing noises that bother you all the time. It will be a good chance for you to get in touch with young entrepreneurs, to meet people with similar minds, to explore the field of entrepreneurship and to look for your potential business partners. If you are interested, please register HERE. Robin Shu: Vice President, commodities department at Morgan Stanley. Graduated from Columbia University. Kelvin See: Forex trader at Citibank. Graduated from Carnegie Mellon University. Li Liangkun: Commodities derivatives, global markets at Societe Generale Corporate & Investment Banking. Graduated from University of Toronto. Xiao Liangping: AVP, IT department at Barclays Capital. Li Xiangnan: project finance, DBS, previously relationship manager (corporate banking) at DBS. Graduated from NTU. Wang Tianyi: Graduate Associate, consumer banking at Standard Chartered Bank. Graduated from NUS. Disaster recovery with dignity, inclusion, innovation and generation and distribution of wealth. Social entrepreneurship experiences and opportunities in Haiti, Chile, Indonesia and Myanmar. Join us for a revolutionary approach to disaster relief and re-building the lives of those affected by disaster and their communities through their active participation in the creation of business, wealth and job opportunities. You will be able to explore and pitch your business ideas for current real-life needs, challenges and opportunities in the field and have them matched to local partners in disaster areas. Entrepreneurs, Social Entrepreneurs, Business Information Technology, Medical, Education and Social Science Students and Faculty Members. Anyone interested in volunteering and helping survivors of the recent disasters. The first segment will be a 45 minutes conference introducing Social Entrepreneurship and Entrepreneurial Relief, including field experiences and specific challenges and opportunities for more efficient intervention. The following 60 minutes will be spent listing and identifying needs in the fields, discussing how to address them through an entrepreneurial approach, pitching the ideas to others and matching them with local partners in the field. Danny Widodo (NUS student and documentary film maker) will be reporting and joining us live from the field in Indonesia for the event. The last 2 hours will be a hands-on exercise on planning and implementing the ideas formulated in the previous 60 minutes. We have already set up a donations and support page on Give.sg. Those ideas that move forward will get their own project page for fundraising on Give.sg. This is the first stop on a global tour to jump-start and promote awareness onEntrepreneurial Relief and identify and connect partners, ideas, needs and local action. This workshop will be followed by a similar workshop the next day at Stanford University (web and Facebook). It is part of our celebration of Global Entrepreneurship Week. This event is open to the public and there is no fee to participate. Although there is no need to pre-register, please confirm attendance on our Facebook event page, so we can plan accordingly for your participation. And join our Relief 2.0 Facebook group for more information. If you are not in the area, you will be able to join us via Skype (add carlosmirandalevy as contact) and follow us via this page here at short.socinfo.com/relief-nus and ustream.tv. Social Entrepreneur in Residence at the National University of Singapore Entrepreneurship Centre (2010-2011), Digital Vision Fellow at Stanford University 2004-2005, Google Developing World Scholarship recipient 2004, acknowledged by CNN as one of Latin America's top 20 most influential people on the Internet (2000). Coordinator of Relief 2.0 and Socinfo.com. Coordinator of over 12 missions to Haiti and an efficient relief support network using social media, mobile technology and independent field units with local stakeholders. Extensive field experience and given conferences and workshops in over 15 countries covering Latin America, the Caribbean, Europe, USA and Asia, in the fields of human development, public policy, education, technology, social entrepreneurship, social media and networks, creativity, innovation, and open and collaborative content since 1996. My consulting work includes ICT Public Policies, National ICT Strategies and National Education Portals funded by United Nations, World Bank, IADB and local governments in 10 countries. Director of Peace Innovation Lab @ Stanford, Stanford Persuasive Technology Lab, Coordinator of the EPIC Global Challenge. Researcher at Stanford Persuasive Technology Lab, Collaboration Evangelist, Stanford Peace Innovation Lab, Persuasive Technology at Vipani.org and Advisor to Gumball Capital. We just had a great session with Denise & Fritz from Qunar.com last week on the evening of Oct 21. For those that attended the event, thank you for your support! Hope you also had a great one like we did. For those who missed it, no worries! We have another event for you this weekend. Chinese Entrepreneurs Organization Singapore (CEOs) proudly presents to you our 5th episode of Experience China & Explore Opportunities - the Developing World on Oct 30th (Sat). We know it is a Saturday. We're sure that your strong interests and enthusiasm will bring you to join us and be part of our third event of this academical year. Ever wonder how to adapt to the rapid changes and catch the opportunities in the developing world? 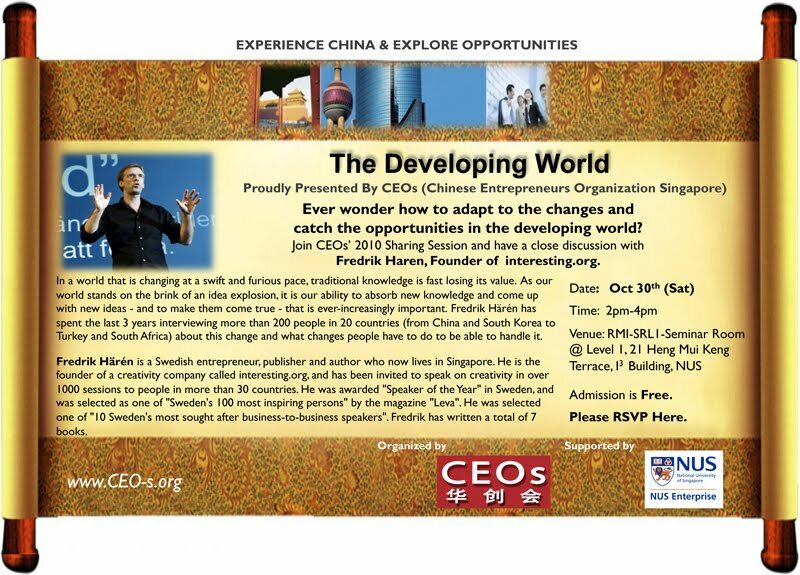 Join CEOs’ 2010 Experience China & Explore Opportunities Episode5 - the Developing World and have a close discussion with Fredrik Härén, founder of interesting.org and author of the book - the developing world. Fredrik Härén is a Swedish entrepreneur, publisher and author who now lives in Singapore. He is the founder of a creativity company called interesting.org, and has been invited to speak on creativity in over 1000 sessions to people in more than 30 countries. He was awarded "Speaker of the Year" in Sweden, and was selected as one of "Sweden's 100 most inspiring persons" by the magazine "Leva". He was selected one of "10 Sweden's most sought after business-to-business speakers". Fredrik has written a total of 7 books. In a world that is changing at a swift and furious pace, traditional knowledge is fast losing its value. As our world stands on the brink of an idea explosion, it is our ability to absorb new knowledge and come up with new ideas - and to make them come true - that is ever-increasingly important. Fredrik Härén has spent the last 3 years interviewing more than 200 people in 20 countries (from China and South Korea to Turkey and South Africa) about this change and what changes people have to do to be able to handle it. What will this rapid change lead to? What problems do today’s’ organizations face when it comes to adapting to the speed of change? What can we learn from the people who are best at adapting to change? What are the advantages of living in a Developing Country when it comes to adapting to this change, and what can the Developed World learn? Admission is Free (with RSVP) Please RSVP by 29 Oct 2010 @ http://rsvp.ceo-s.org/episode5. For general enquiry, please feel free to email us at info@ceo-s.org. If you are interested in getting involved with planning and organizing future CEOs events, please DO NOT hesitate to email us at join@ceo-s.org. 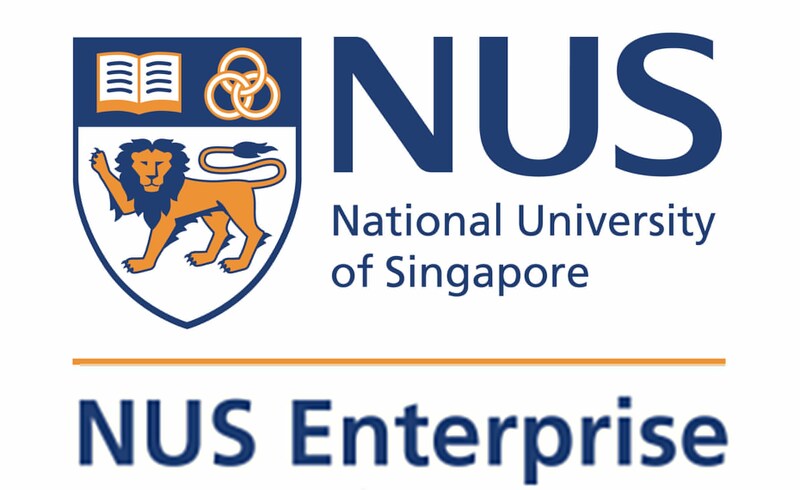 Chinese Entrepreneurship Organization Singapore (CEOs) ®C This organisation aims to build strong ties between Singapore and China, to help young Chinese entrepreneurs succeed. CEOs aims to raise the interest in business opportunities present in Singapore and China, as well as expose students to the business landscape, culture, etiquette and development of both countries. This will be done through a number of activities such as student/ businessman/ Chinese entrepreneur sharing events, business trips to China and arranging Chinese visitors to come to Singapore. CEOs will help to increase cross-investments in both countries, establish business partnerships and collaborations, as well as boost business tourism. Ever wonder how to build and develop an online business in China? 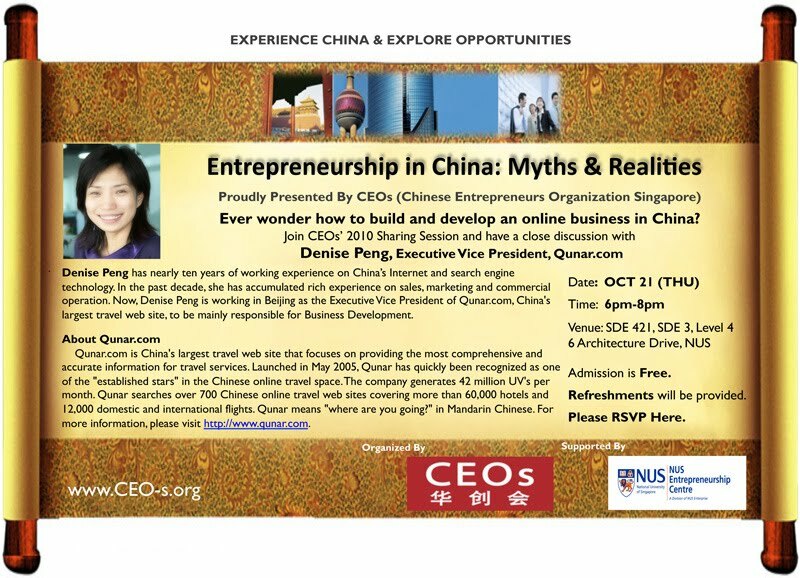 to reveal the myths & realities of Chinese Entrepreneurship! Denise Peng has nearly ten years of working experience on China’s Internet and search engine technology. In the past decade, she has accumulated rich experience on sales, marketing and commercial operation. Now, Denise Peng is working in Beijing as the Executive Vice President of Qunar.com, China's largest travel web site, to be mainly responsible for business development. Prior to joining in Qunar.com, Denise Peng, one of the founders of Shawei.com, was preliminarily responsible for the plan and technology implementation of Shawei.com, and then became the Multimedia and Interaction Director to take charge of relevant business cooperation and technology implementation. Born in Beijing, Denise Peng was a bachelor of Information Processing and Smart Identification at Harbin Institute of Technology and minored in enterprise management. In the spare time, she likes swimming and watching films. Qunar.com is China's largest travel web site that focuses on providing the most comprehensive and accurate information for travel services. Launched in May 2005, Qunar has quickly been recognized as one of the "established stars" in the Chinese online travel space. The company generates 42 million UV's per month. Qunar searches over 700 Chinese online travel web sites covering more than 60,000 hotels and 12,000 domestic and international flights. Qunar means "where are you going?" in Mandarin Chinese. For more information, please visit http://www.qunar.com. Please RSVP via http://www.flickevents.com/ceos by Oct 21, Thursday 4pm.